7 Deadly Sins The Actor Overcomes provides a unique approach to the profession of acting. The profession of acting is a vastly different conversation than the artistic desire to perform. One could argue the business of performance art may be the most difficult relationship you ever have with yourself. The desire to perform on stage is innate. The credibility afforded the actor who performs regular… ly on stage is well earned. However, your belief system about the art, when challenged by the desire to make money acting on camera, can be an emotional and psychological conundrum. 7 Deadly Sins The Actor Overcomes provides a fundamental toolkit to increase the likelihood of success in your on-camera acting career, while protecting the delicate balancing act of offering your psyche and soul as a product for sale. This work will also guide you through many of the emotional and philosophical traps that snare actors almost every day. 7 Deadly Sins The Actor Overcomes has no interest in, nor does it attempt to marginalize, the importance of theatre or stage work. Live theatre is the cradle of scripted performance. This work both acknowledges and applauds those who make a living at it. Many actors are able to use theatre work to make a living and increase their credibility, based on the specifics of their regional marketplace. Even so, theatre work may not lead to or assist in the development of an on-camera career, leaving some actors in a sea of self-doubt. Yes, there are actors all over the world who make money performing on stage. However, the strategies, concepts and techniques introduced in this work do not often relate to the business protocol of stage acting. If you predominately have only worked on stage, the process of evolving from one medium to the other can be a grueling transition commonly avoided by actors. Scripted film and television is referred to as theatrical work in the United States of America. To say you want to be a working actor is easy. To actually accomplish this is anything but. 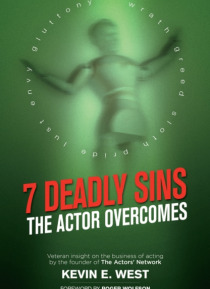 7 Deadly Sins The Actor Overcomes addresses the specific business efforts associated with on-camera scripted acting as the pursuit of a theatrical career for money presents many unique challenges not associated with stage work. Our daily lives are complicated enough. To also attempt transmuting a life of passion for performing into a paid career is exponentially more complicated. The seven deadly sins to which an actor may succumb (as defined in this book) can wreak havoc on your professional goals and dreams, as well as on your personal life. The psychological and internal conflicts between the Show and the Business of acting can damage one's human operating system. Establishing a stable organization as a keystone for any career is intrinsic to its success. But the pursuit of an on-camera acting career can feel diametrically opposed to the art of being an actor. A skilled on-camera actor is required to combine/blend/fuse/unite the art of acting with the business pursuit and mentality of being a commercial product; this requisite presents a paradox. Managing the state of your psyche while balancing the needs of the performer within and the industry's demands on and expectations of you as human product-day after day-is critical. The choice to pursue acting for money cannot be taken lightly. The 7 Deadly Sins The Actor Overcomes philosophy will guide you through the mental pitfalls, emotional dangers and professional apathy inherent in the pursuit of an on-screen acting career: beware of Lust, Greed, Gluttony, Sloth, Wrath, Envy and Pride.